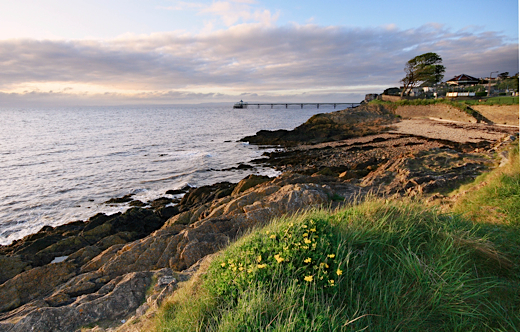 A route through Clevedon following coastal roads, quiet country lanes and one of the meanest hills around. Taking the standard route out of Bristol (Abbots Leigh Rd -> Beggars Bush Ln -> Clevedon Rd) the fun begins when you turn right onto Portbury Lane. Here you get a relatively long and fast descent with nice wide corners to test your descending skills. At the bottom you take a left and immediate right to take the footbridge over the M5 and follow the A369 into Portishead. There is a climb out of Portishead up Nore Road which brings you up to some nice coastal views (provided the estuary isn't shrouded in mist). Following the road along the coast you eventually descend down on Walton Street onto the B3124. Be careful near the end of this descent, the road becomes quite narrow on a corner and cars can come round quite fast, taking up the entire road. Join the B3124 by turning right at the bottom of Walton and take an immediate right onto Holly Lane. There's another short climb and this winds round to a fun descent into the pier area. Ice cream time. On the way back you re-join the B3124 and then take a right early on, joining Nortons Wood Lane. This is a very quiet and narrow road - take care when riding in a group because cars occupy most of the lane, with it being so narrow, and there are lots of blind corners. Also take note, this road can become a little mucky when wet - if you love your bike spotlessly clean then maybe stick on the B3214. If you aren't so precious, enjoy the lovely vista from Norton Woods Ln -> Clevedon Ln across the valley to your left! Approaching Clapton-in-Gordano you will meet Nash Hill. Take a right and slog your way up this steep and relentless climb. At the top you keep going along Whitehouse Lane and re-join Clevedon Road (B3128). Take a right down Waxall Hill if you prefer an interesting route back (otherwise just blast back on the B3128) and take a left onto the B3130 to and through Long Ashton, finishing up into Ashton Court.